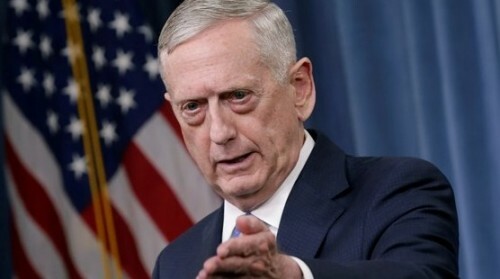 Washington : The US Defense Department on Wednesday promised South Korea that it would maintain bilateral military cooperation, adding that it will also continue with the program of joint military maneuvers to confront "the security challenges" in the region. The defense departments of both countries confirmed that the alliance between Washington and Seoul will continue, according to the text of the agreement reached between the two parties and released by the Pentagon, Efe reported. The pact comes after Defense Secretary James Mattis welcomed his South Korean counterpart, Song Young-moo, to the Pentagon on Wednesday. According to the document, the commitment reached between the two countries will respect the "spirit" of the current bilateral mutual defense treaty, the objective of which is to prevent "armed conflict on the Korean Peninsula and (promote) peace and stability in Northeast Asia." Both officials expressed their support for continuing with the joint military maneuvers which are held regularly by the armed forces of the US, South Korea and Japan, although they did not mention whether military exercises could be cancelled in the future in a gesture toward North Korea. In recent months, the US government ordered the suspension of two important military exercises so as not to derail negotiations between Washington and Pyongyang about the possible denuclearization of the Korean Peninsula. The Pentagon also committed itself to maintaining the US troop presence in South Korea. A few months ago, US President Donald Trump said he would support withdrawing US troops stationed in South Korea, alleging that maintaining them there cost too much. Currently, Washington has some 28,500 troops stationed in South Korea, a deployment that costs about $1.6 billion annually, although that amount is shared equally between the two countries. Meanwhile, Secretary of State Mike Pompeo said in an interview with Fox that next week he will speak with his North Korean counterpart, Ri Yong-ho, about the possibility of international inspectors examining the regime's nuclear testing sites. The White House has not yet said whether Pompeo will travel to North Korea in person or speak with Ri on the telephone.